Don’t use the stock market’s reaction on Friday as a litmus test for the strength of the November labor report because the market has been very volatile. Job creation was a slightly disappointing. It might indicate the labor market is near full employment. Overall labor force participation rate was steady at 62.9% which beat estimates for 62.8%. The prime age employment to population ratio was 79.7%. That's 1.1% away from the average cycle peak in the past 3 expansions. Before the late 1980s cycle, women weren’t in the workforce at a high enough rate to form a valid comparison with this cycle. From November 2017, to this November, the employment to population ratio has increased by 0.7%. That could mean the labor market will reach full employment in over one year. That’s in tune with the yield curve signaling a recession in 17 months. This signal hasn’t gone off though as the 10 year yield is still higher than the 2 year yield. A takeaway is job creation in 2019 should be higher than population growth. But likely slower than the 2018 average of 208,000 jobs created per month. There’s no reason to sell stocks on this labor report. The unemployment rate is low, but there’s still a little slack left. This thesis helps us understand the data when the labor market is broken down by education. Labor participation for those without a high school degree is at a record high. Yet, it hasn’t recovered much for those with a college degree. 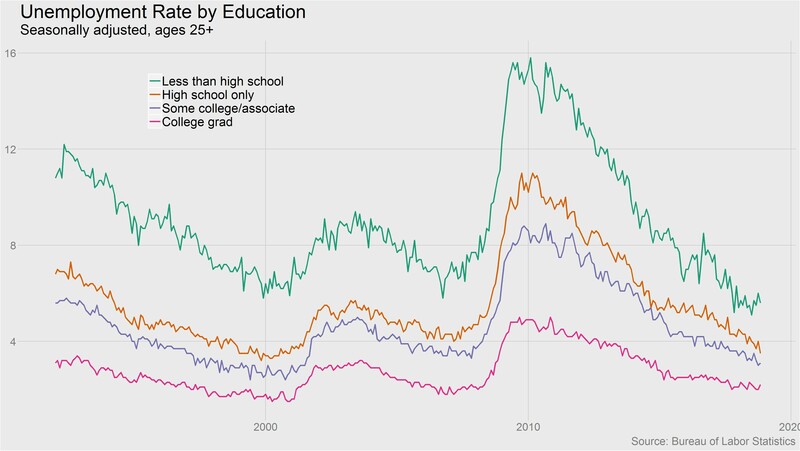 However, the unemployment rates for all education groups are near the 2000 lows as you can see from the chart below. The education gap has shrunk dramatically. By this I mean, the difference between the unemployment rate of people without a high school diploma and those with a college degree is low. Those with a college degree are much less likely to be subject to layoffs in recessions. However, that might come closer to the overall unemployment rate next recession because so many people have a college degree.